First published in Science, 19 (no. 475), 143-144. In the spring of 1891 an appropriation of $1,100 was made for the equipment of a laboratory for experimental psychology at the instance of the writer. A suite of rooms, of which the accompanying cut gives the dimensions and arrangement, was set apart for the use of this department. 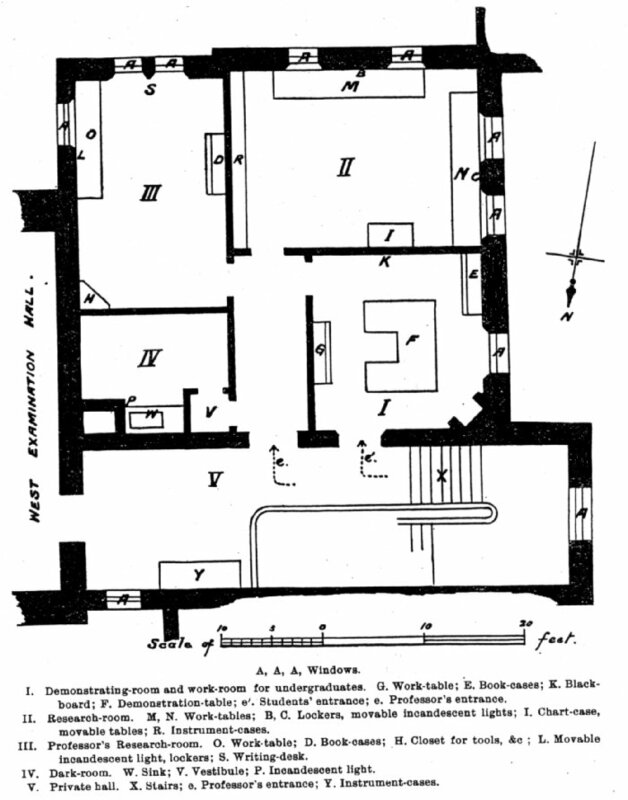 The laboratory is located at the west en of the restored University College on the first (not the ground) floor. I is isolated entirely from the general work of the building, being for the room of the physical department. The rooms have little light exposure from three sides. The room which is used for students' demonstration and practical work (I, in the plan) is cut off from the research rooms, thus making interruptions of the latter from noise, etc., unlikely. For the same reason, the central hall is laid with cocoa matting. The work-tables of the research rooms (II. and III.) get light from the east, south, and west, a variety of which his of great value, especially as the east exposure (Room III.) has reflected light from the walls of the main building (this is also partly the case with the light from the west windows, Rooms I. and II.). The rooms are artificially lighted by combination of gas and electric chandeliers from the ceilings, and have besides movable incandescent lamps over the work-tables. The dark room is also furnished with incandescent lights. The floors throughout are carefully laid in hard wood. The [p. 144] work-tables are braced diagonally from the walls by iron rods. The rooms are heated by steam radiators. The walls and ceilings are finished in dull white and the woodwork in dark walnut, colors being avoided in order to keep the physiological conditions of sight normal. Natural and colored light can be let into the room through the south wall. The central hall is lighted through glass panels in the doors. The fittings of the laboratory have cost about $450 -- a grant additional to the appropriation of $1,100 for instruments. This does not include, however, the arrangements for lighting, heating, and the special flooring. It is probably that the cost would be slightly higher in the United States. Of the original amount appropriated, moreover, $300 is an annual allowance for the maintenance of the laboratory. The writer hopes, also, to have soon a paid assistant, who will be constantly at work in the rooms. The laboratory will, it is hoped, serve two main purposes: First, it is used to illustrate the undergraduate courses in psychology in the university; and, second, it is designed to serve as a centre for advanced research in the new lines of experimental work. Being the only foundation of the kind in Canada, it will represent what we are doing in this line in the Dominion. The Department of Education of Ontario undertakes with great liberality to publish the researches of students who do work of real merit, and to distribute them generously. Publications issued from other such centres everywhere will be received in return with much gratitude; and new ideas in matters of technique, arrangement, etc., especially detailed notices of new pieces of apparatus, reprints from the journals, and announcements of new discoveries, will be welcome. The accompanying plan is published at the suggestion of several psychologists who have borrowed and examined it; it is thought that the details may be of use to professors, boards, or trustees who are contemplating the providing of laboratories. The first in the British Dominion far as my information goes.